Along with paintings by John Hampshire and John Connors, their work can be seen at Carmen’s through the year. The show will close with Carmen’s annual Christmas Eve Community Potluck, open to all. Seventy years later, what’s happened to the home of blue collar in the Collar City? Carmen Gonzalez of Carmen’s Café asked artist Scott Foster if he could translate what he saw into paint. 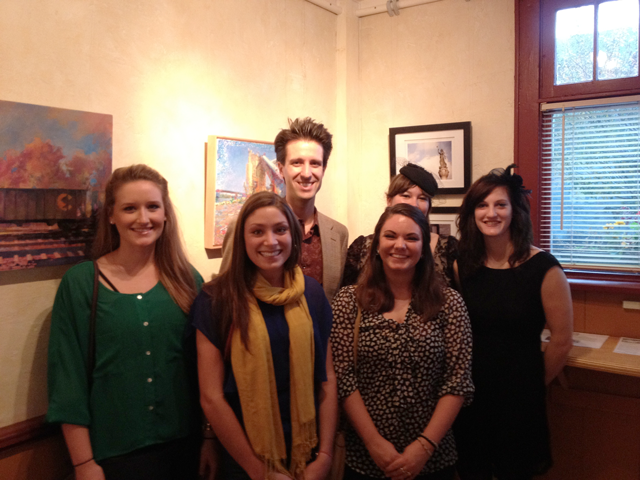 He asked his five of his top art students at Siena for help. The result is the show, “South Troy Through Outsider Eyes,” opening Thursday, October 25 at Carmen’s Café in— you guessed it— South Troy. Hard enough, it turned out. One renovation followed another and another, transforming the former Isabel’s on First and Adams Streets into a hip bistro, Carmen’s Café. “People come up from the City and say,’Wow, this is like Brooklyn,’ ” said Carmen. “I tell them, ‘ No, it’s just like South Troy!’ Now, that’s a compliment.” Rotating art shows and live music on Fridays make the Café both a neighborhood hangout and a regional scene. Carmen’s partner, Jim Lewis, also runs Springwood Studios (formerly Icarus Furniture), known for sculpture and high end church furnishings. He built the counter of native Troy ailanthus. “That’s the ‘weed tree’ you see in vacant lots everywhere,” said Lewis. “It’s a great furniture wood, everyone asks about it, but you have to cut it yourself.” Lewis curates the exhibits and helps book the bands. “South Troy through Outsider Eyes” can be seen at Carmen’s Café, 198 First Street Troy. 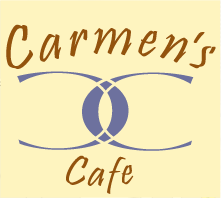 It closes on Christmas Eve with Carmen’s annual Community Potluck, open to all. My art is influenced by the raw beauty all around us. I draw upon personal emotions, feelings, and their resultant actions as an inspiration for my work. I also find the quietness in nature and myself, and draw out the elements of life that go unnoticed. I love art because it is not just creating. There is a process involved that is just as important as the end result. For me, the process is a release that temporarily relieves me from the outside world. In my work I have incorporated aspects of the local iconography that symbolizes an idealized vision of Troy. This simplified subject mater lends itself well to formal and technical manipulations. By using untraditional painting implements implements, and optical color mixture, I create a multifaceted and multidimensional image of a single subject. Being born and raised in the city of Troy I decided to draw my inspiration from my parents specific memories of living in the area. The best way to capture the essence of community is to understand how it is seen through the eyes of the people. Therefore, I interviewed members of my family so that I could accurately represent their most memorable experiences of growing up in Troy. The everyday routines of going to the market or playing in the alley are but a few of the simple yet meaningful aspects of living in this community. Troy contains areas of beauty and areas of decay. For some, that tilted, broken-down stoop represents their entire childhood. My pieces work emphasize the beauty within these gritty details. Absence and loss, not presence, shapes my definition of beauty. An aspect of this conception of beauty is memory, the anticipation of change, and the struggle to fix a moment in the mind. My paintings are reflections of changing ideas about the societal relationships to the land, the American experience, and the American dream. The landscape is an arena in which many different dramas of the American dream are played out. Trailers, houses, and strip-malls evoke shared experiences. This common denominator gives my work a broad resonance that allows even fragmentary visions to evoke complex narratives. My watercolors and oils eschew the particulars—what makes a location unique—and focus on the iconic—what makes disparate subjects universal.